* How to grow attractive friendly lawns. Many gardeners take pride in growing lawns that are richly green, weed free and even. And a fine front-of-house lawn is the standard bearer of many a stately looking garden. But there are alternatives. 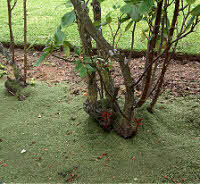 On the-organic-gardener.com you'll learn more than how to grow and maintain a beautiful lawn. You'll also discover less conventional ways to grow lawns that are perhaps even more beautiful. And I explain how to use your organic lawn to add value to your whole garden. Herb meadows and pasture lawns - blend your boundaries into a walk on the wild side. Check out this link to compare lawn styles and discover the rich and beautiful ways to be green. The importance of lawns goes beyond their looks or a fashion statement. Organic lawns are indeed a valuable resource that you can use to feed the rest of your garden. But only if you avoid using expensive feedn'weed chemicals. So before laying the foundation for a new organic lawn let's consider the alternatives. 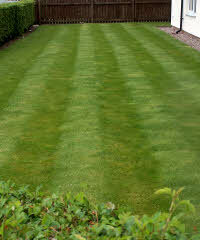 They're all detailed on this link to my page about discovering your favourite lawn style. Furthermore, when you opt to grow flowering lawns you also attract friendly creatures that help you protect your garden plants. So why not consider the organic lawn care alternatives outlined on this link... Check below if you want to learn more about organic lawn maintenance. Lawn conditions vary considerably and many types of machines are available to cut grass. So take a look at this information to find the right lawn mower to suit your particular lawn and your lifestyle. The differences between them can make your lawn mowing job much easier. You can learn more about regular lawn maintenance with this link. Are you looking to solve problems in your lawn? You'll see new and updated pages to help you solve organic lawn care problems and maintain your lawn in tip-top condition. Check out the seasonal organic lawn care guide on the link. Many gardeners experience problems with lawn weeds and moss. So the-organic-gardener.com provides a special page to help you find the cause and an organic lawn care remedy for lawn weeds and moss. Organic gardeners must question whether the time and work devoted to regular grass cutting is really necessary. Yet below I explain how you can still have a fine lawn and feed your organic garden. There are many practical benefits to enjoy with organic lawn care. You save both on weed killers and on fertilizer. Because by recycling your lawn trimmings you are effectively re-using your lawn as fertilizer. And you do that by turning lawn trimmings into garden compost. The best compost bins for lawn trimmings are described on this link. The bigger your garden the better because you really can't have too many lawn trimmings. But when you don't have enough compost bins to cope, there are several alternative ways to use them. The value of recycling grass in an organic garden can't be over emphasised. So when you have more grass than you need, consider these additional advantages. You can lift and stack your extra grass as turfs to make garden loam. Then use this to make seed and potting compost. It will be relatively weed-free. Then grow beans and clovers and re-sow grass to make even more turfs. When your grass comes from a meadow you can make hay or straw. This can be used as mulch as explained above.